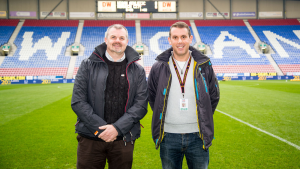 Wigan Athletic Supporters Liaison Officers provide a direct link into the football club, allowing fans to put their thoughts and views across on any subject they wish. They hold regular meetings with the Wigan Athletic management, the club’s Security Officers and the various online unofficial supporters groups; this will enable the club to hear all views before any decisions are made. Recently the Latics Fans Advisory Board has been set up, which brings together 15 fans, management of the club and the SLOs in one room once a month to go through issues.